When you’re assembling your digital marketing dream team, who do you prioritize? The writer? Designer? Videographer? Social media expert? They’re all important roles, to be sure (the writer, in particular, let’s be honest), but don’t overlook your content strategist. Without a strong content strategy in place, a beautifully written blog is just that, and nothing more. 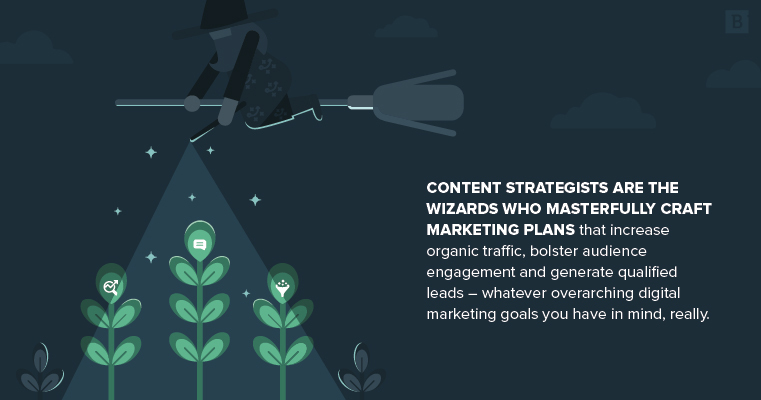 Content strategists are the wizards who masterfully craft marketing plans that increase organic traffic, bolster audience engagement and generate qualified leads – whatever overarching digital marketing goals you have in mind, really. If digital marketing is a battle – and it can often feel that way – then your content strategist is your general. They’re the ones assessing your adversaries’ strengths and weaknesses, devising the most effective strategies to meet your goals and ultimately putting those plans into action. Your legion of writers, designers and videographers do the ground-level “creation” of content, but it’s the content strategist who marshalls these creative forces and spurs them to action with a comprehensive roadmap detailing the objective of each asset. That roadmap is driven by data at all times. Content strategists do a great deal of research into keywords, competitors, target audience and industry trends – among other areas – to ensure content is optimized accordingly. Strategists are also responsible for executing routine content and strategy audits to check that the roadmap is on track and bringing about the kind of ROI you expect (conversions, qualified leads, etc.). If something isn’t working, it’s back to the drawing board to identify what’s missing from the current strategy and what course corrections need to be made. In some cases, a content strategist may take a hands-on role in the creative process, writing blogs, landing pages, social media posts, etc. themselves, but it’s by no means a requirement. In fact, there’s a strong argument to be made that by separating content creation and strategy into distinct responsibilities, both sides have more time to focus on their specific areas of expertise. It’s a big responsibility, which is why you want only the best and brightest to manage your digital marketing strategies. What qualifications should a content strategist have? Should your content strategist have a background in marketing? Journalism? Data science? Although there’s no set formula for the ideal strategist, a degree in any of these concentrations provides a solid foundation to build upon. Your strategist should have a healthy interest in all facets of data-driven content marketing so they can map out the most effective strategies, pair them with high-quality content and routinely run audits to check performance. Of course, a Google Analytics certification is pretty much a prerequisite for any strategist worth his or her salt. A giant piece of the digital marketing puzzle is pulling performance metrics out of Google Analytics, which is why so many of the best strategists basically live in there. There are plenty of other SEO research tools out there that can supplement Google Analytics – SEMrush, Searchmetrics and Moz, to name a few – and a content strategist should feel comfortable navigating those platforms and finding useful data in a flash. Past experience creating digital marketing strategies is also a huge plus, since you really don’t want to trust your all-important campaigns to someone who’s basically cutting their teeth on your dime. Qualifications are all well and good, but they only give you a glimpse of someone’s digital marketing acumen. The right combination of skills is essential to creating impactful SEO and content strategies, running in-depth audits and generating the kind of meaningful ROI that will turn execs’ heads. Let’s not sugarcoat it: Content strategists spend a big chunk of the day with their heads buried in analytics dashboards, analyzing performance metrics and creating ROI reports. That’s certainly not everyone’s cup of tea, and to be successful as a content strategist, you need to embrace the analytical struggle. You’ve got to love combing through dashboards, spotting trends, looking at the competition and using the ample amount of data available to come up with the best SEO and marketing strategy possible. Obviously, there isn’t a magical one-size-fits-all strategy out there – every business needs to tailor their approach from year to year and quarter to quarter. Being able to accurately size up a company’s needs and identify the best way to achieve its marketing goals is key. Content strategists may not necessarily be the ones actually writing blogs, designing graphics or creating animated videos, but they still need to speak the language. In an agency, your strategist must be able to listen to client feedback and succinctly share that information with creative teams and provide actionable next steps. There’s a big difference between what a client says and what they’re trying to say, and strategists must be able to parse through the two. Having an eye for writing, design and video is extremely important when providing consultation and assessing existing content. It’s going to be an awfully tall task to give clients or internal stakeholders recommendations for improving blogs, landing pages and videos if you don’t know what good writing, design or video work looks like in the first place. Content strategists have a laundry list of items to keep track of: digital marketing, campaigns, content calendars, social media schedules and analytics audits, among many others. Only someone who’s extremely organized will be able to stay on top of every single detail and make sure that absolutely nothing slips through the cracks. Ask any content strategist: It always feels like there are a million different things happening all at once. It takes a world-class multitasker to successfully juggle all of the balls that seem to be perpetually hanging in the air. At any time you might need to create an ROI deck, run a content audit or even construct an entire digital marketing strategy from scratch. That’s not for the faint for heart – or the scatterbrained, for that matter. From an agency standpoint, the ability to effectively communicate with clients and present a digital marketing vision is critical. In-house content strategists need to be able to sell their ideas to department heads and executive decision-makers to obtain leadership buy-in. You also need strong interpersonal skills to work with creatives, provide constructive feedback and get the most production out of your content marketing team. Content for content’s sake is recipe for digital marketing failure. Good strategists know that every piece of content from the smallest tweet to the largest animated video needs to have a specific purpose and support business goals. This is where content strategy “generals” earn their stars. Driving revenue and increasing sales figures. Ideally, these goals are mapped out when a content strategy is first devised, but strategists need to keep a watchful eye on everything their teams produce to ensure content and business goals are strongly aligned. Of course, all of that content needs to live somewhere and be released at the right time to support marketing campaigns. Content management is another critical responsibility for content strategists, requiring them to check that blog pages are regularly updated, downloadable materials are properly gated and that social media feeds share the content that’s relevant to a brand’s current marketing campaign. It’s a lot to juggle, but the best content strategists are born multitaskers. In a perfect world, every piece of content would drive legions of new customers to your site, encourage them to sign up for a sales demo or even make a purchase. That’s not the world we live in, unfortunately, and blogs, white papers, infographics, landing pages and social media posts all crash and burn on a regular basis. Every content failure is a learning opportunity, however. The more you can understand what’s underperforming – and more importantly, why – the better your next strategy or piece of content will be. Content audits are time-consuming, to say the least. They cover so much ground that they can feel like full-time jobs unto themselves. But you can’t take any shortcuts with these audits, and strategists need to be prepared to routinely take that deep dive into content and site performance and verify that your digital marketing efforts are actually paying off. It doesn’t matter how good your content is, if your website is difficult to navigate and browse, there’s a good chance no one is going to stick around long enough to find it. Part of any good content strategist’s repertoire is the ability to assess a site’s user experience and improve it when necessary. How intuitive is the site’s design? Can visitors find the information they’re looking for with relative ease? This is easier said than done. You wouldn’t believe where some people hide their company blogs. How fast is the site? Sluggish web design can doom even the best content. Site visitors may not stick around to find out if all of those slow-loading pages are worth the wait. Does the site reflect current design philosophies? If you feel like the best company websites tend to look the same, you’re not imagining things. They call them web design best practices for a reason. Whether you’re targeting mobile users or a desktop-first audience, your site needs to be painstakingly crafted to provide the best UX possible for those individuals. Content strategists should operate as a UX consultant to some degree, capable of assessing a site’s design and identifying spots where it comes up short. Content strategists should also have a heavy hand in the development of brands’ social media campaigns. That means keeping a sharp eye on postings across different channels, measuring engagement levels and determining if your social efforts are having the intended effect. Effective social media strategies involve a whole lot more than just sharing your latest piece of content at random intervals. What channels are you using? What time of day and week are you posting? These details matter, and it’s up to the content strategist to work with social teams to devise the best plan possible and then follow up to ensure it’s properly executed. Does that sound like a lot to handle? It should – content strategists are responsible for overseeing every aspect of digital marketing and ensuring that every component serves the larger goal. It’s a lot to ask of one person, but the best of the best are more than up for the challenge. If you’re still asking yourself, “Do I really need a content strategist?” the answer is a resounding, “Yes!” Trying to conduct a digital marketing campaign without a content strategist is like trying to fly an airplane without a pilot – theoretically possible but almost certainly disastrous.